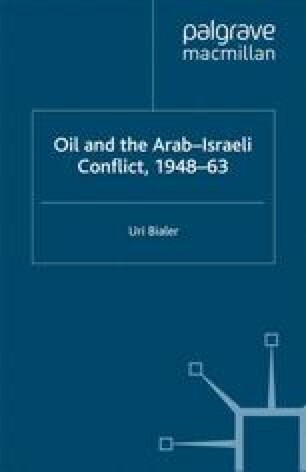 The developments analysed in the previous chapter necessitated a new look at Israel’s oil supply. The long-term solution to that problem obviously lay in the development by Israel of sufficient crude oil production in its own territory, and the reinstating of the normal supply Une from Iraq. As that was impossible to achieve, the main objective of Israel’s oil policy for the time being was to have admission to crude oil markets with maximum flexibility in normal times to buy at the lowest possible price, and in times of crisis to have access to reliable sources of supply.1 This meant, in practice, that oil supplies should not be dependent on any one country or area, however advantageous such supply might appear in normal times, for reasons of price, but that the alternative options should be maintained. Israeli policy-makers well understood that the overriding problem was to assure safe sources of supply. Still, when pressing for that assurance, they were equally aware that in ‘normal’ times all oil companies were interested in selling oil and when negotiating with them should not be allowed to assume the stance of benefactors. On the other hand, in order to gain their cooperation in a crisis situation, it was essential, especially in the case of Israel, to grant the companies equitable terms in normal times. The inevitable operational consequences of such reasoning were the efforts to obtain a substantial fraction of Israel’s oil supplies either directly or indirectly from a number of international major oil companies who were the only bodies with sufficient flexibility of oil sources.